We have the right one! mo systeme designs and manufactures premium in- and outdoor exhibition stands for face-to-face marketing activities such as roadshows, fairs, promotion etc. Our products are easy to brand, transport and set up and hence perfect for temporary promotion activities. 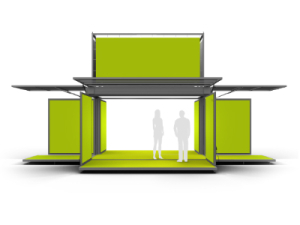 The modulbox is our first product and still our flagship: It is a 2.7 cubic exhibition trailer that opens up in the blink of an eye to become a 65 sqm open pavillon with brandable walls, roof, floor, you name it. Our modulbox MAX is big. So big, in fact, that a car fits inside. 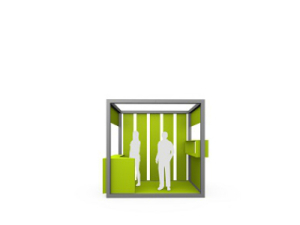 It can be opened to all four sides and is as easy to transport and set up as the original modulbox. 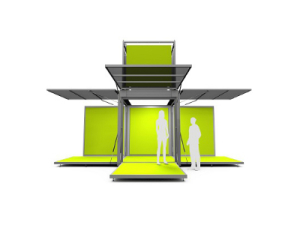 Within one hour it transforms into a compact pop up store. 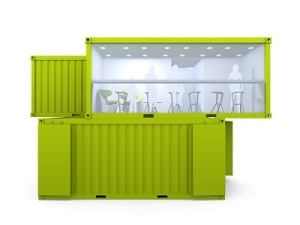 We convert shipping containers into anything from rough-and-ready underground bars to high-end exhibition spaces of a much higher durability than other temporary architecture. The two halves of mo pop fit through a normal door frame and can be easily transported by hand, even through the crowd. Set up is done in minutes. Perfect as pop up store! mo5 is our most compact face-to-face marketing solution: a brandable promotional counter on wheels with a floor, a roof, and lots of storage space to boot. Unsure how our products can help you or your customers reach your goals? Market strategies are not our business, but live communication sure is. Give us a call. Our customers have used our products worldwide: From Times Square to the Red Square, from North America to South Africa. Our local partners provide service wherever you go. All our products can be rented and rebranded. 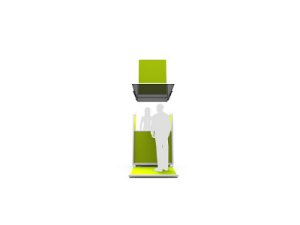 They are so easy to transport and set up that you can eliminate idle time, logistics machinery, and logistics staff. Since 2004 all our exhibition stands have been manufactured in Berlin, Germany in order to guarantee the highest standards of quality. “Made in Germany” is represented in every single piece: Sustainable materials, intelligent design, environmental friendly logistics and an efficient process. Until today we have continuously improved and extended our product and service portfolio. Nowadays we offer five different indoor and outdoor exhibition stands that are distributed all over the world. Our local partners provide service in Europe, North America, Africa and New Zealand.